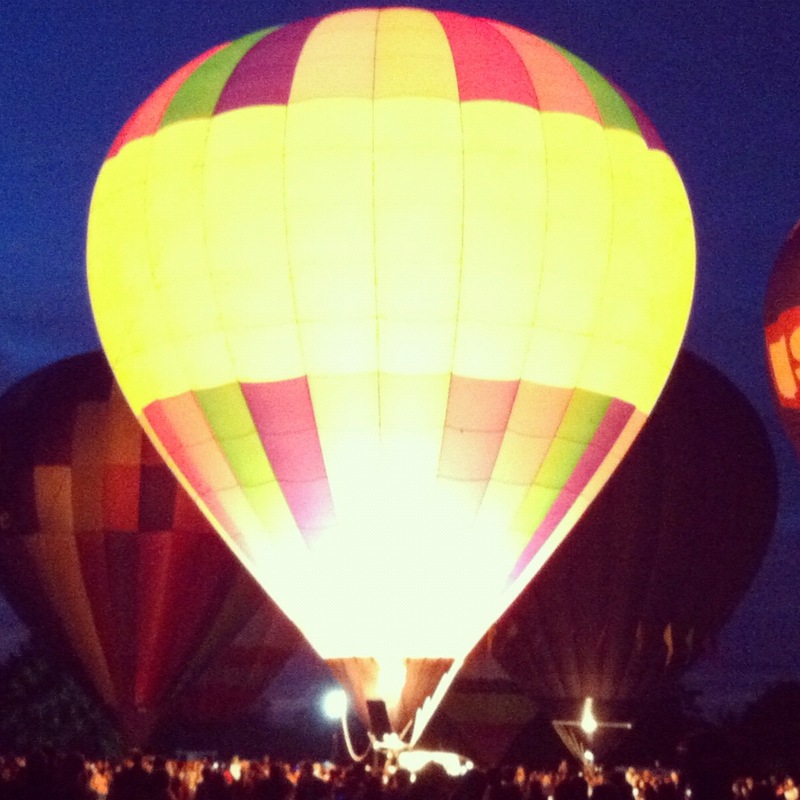 Last Friday night, my husband and I took some very good friends to the local “Balloon Glow,” which is an event held the night before the Great Forest Park Balloon Race. Everyone gathers in the park to watch the giant hot-air balloons being blown up, and after it gets dark, the balloons light up randomly, a few seconds at a time. Every so often, a loud whistle blows as a signal that all the balloons are going to be lit up at the same time. It’s an incredibly beautiful sight. 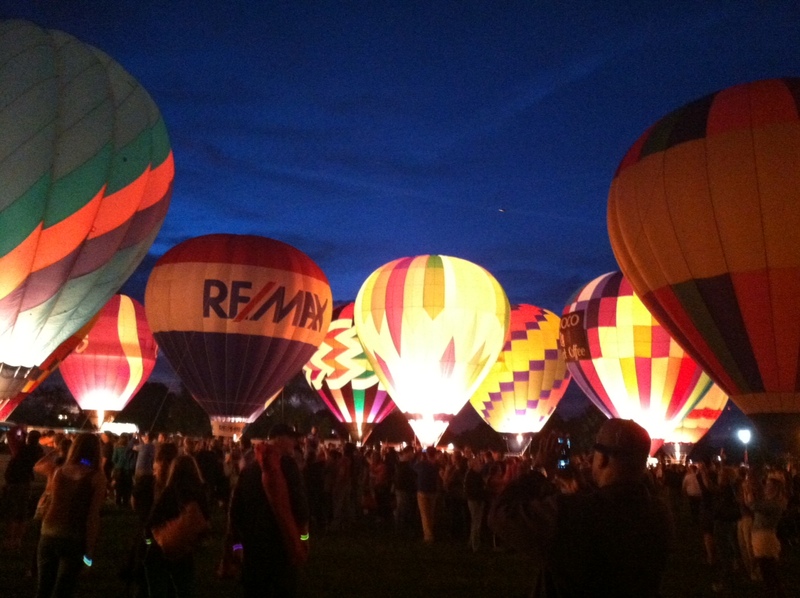 My husband and I have been to this event several times, but this was the first year that this couple joined us, and they were very excited to see the balloons all lit up. They brought their camera, and we came early to beat the crowds and make sure we didn’t miss anything. We even paid extra to attend a special fund-raising event at the Balloon Glow that meant we would have a place to sit and enjoy drinks and dinner while we enjoyed the sights. Unfortunately, it was so windy that night that they were unable to even blow up the balloons, much less light them. So we had come all that way, and paid all that money, just to see a bunch of deflated balloons lying on the ground. Later, it occurred to me that the whole evening was a great example of how little control we often have in what happens to us, but how much control we have in how we choose to react to what happens to us. I couldn’t make the wind die down, and (although I had the good sense not to try), I’m quite sure I couldn’t have convinced any of the event’s leaders to proceed with the Balloon Glow despite the wind. But what I could do was acknowledge our disappointment, and then let go of it, and simply get on with having a nice night out with dear friends. And I can honestly say that we had a wonderful time together, even without the hot-air balloons. There will always be bad stuff in our lives, from the minor disappointments of deflated balloons, to the major stuff of serious illnesses, natural disasters, financial hardships and the like, and there will be times when we just have to let ourselves feel the anger, fear and hurt that comes with them. But even in the worst of times, we can choose to look for and embrace the good that is always there if we just allow ourselves to see it and respond to it. Good stuff and bad stuff are always with us, but we get to choose which one we dwell on, and I believe that life is so much better we when try our very best to focus on the good. It’s not always easy, but it is always worth it. When I think about you, it’s about someone who most always tries to find the good to dwell on. Thank you Dena! You have no idea how much I miss you, but I’m looking forward to our visit! It is always about attitude and when you are having a good evening with friends who could as for more? Exactly! The balloons will be there next year, and we’ll just enjoy them then. But we still had a wonderful time with good friends…. and that’s a gift! Words to live by. Sometimes we could use this reminder in our lives. Thanks. You’re absolutely right, Ann. Attitude really is everything and it’s never about where you are but rather who you’re sharing those experiences with and what we choose to focus on. Nice post, Ann. Thank you, George! It’s taken me a long time to learn that, and I still have to work at it sometimes. But attitude really does determine the quality of our lives to a huge extent, I think. You’re welcome! And all the best to you…..
Well put. Cherish the moments! I guess it was a bit disappointing but still valuable for helping you to get things in perspective. Who needs balloons when you’ve got good friends? It took us a little while, but we came to that conclusion, and had a terrific night! A positive attitude goes a long way in life!! Thank you, for both your kind word and for the reblog! Thank you for the reblog, and the kind comment!!! I enjoyed your message but I enjoyed your writing style even more. You are a very good story teller. You should be proud! Thank you so much! I love your blog as well!